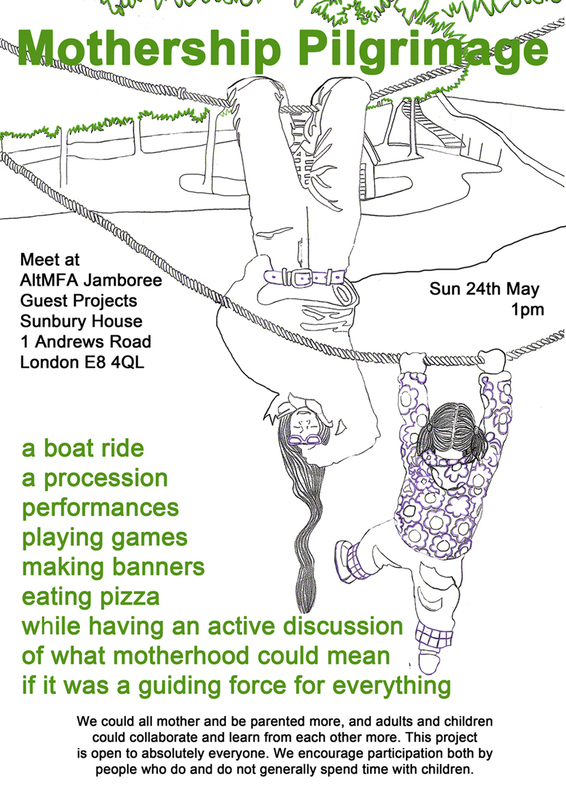 Celebrating both motherhood and childlessness, a diverse group of adults and children travelled a route through Hackney by boat, through parks and a pub, collaborating and creating; making banners, swapping stories and playing; to create an alternative matriarchal mythos in a state of heightened attention and joy. Motherhood plays some role in every person’s life. We wish to broaden the perception of what motherhood can mean to the individual, as well as within language and society. Could mothering be usefully employed as a model or inspiration for government and other forms of social organisation? Should ‘mothering’ be an activity exclusive to parents? Is adulthood toxic for children? What is the compulsion to have (your own) children? Activity filled Boat-ride along Regent’s (Birth) canal from Broadway market to Victoria Park.